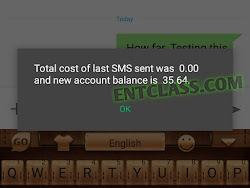 This is yet another MTN cheat to send unlimited free SMS, brought to you by Entclass.com.ng. I have tested and confirmed this trick before publishing it on this blog entclass.com.ng. I will quickly teach you all how I've been sending free SMS on my MTN line without MTN deducting a dime from my Airtime. Before i proceed to revealing this latest MTN free SMS cheat, let me quickly bring to your notice that there is a drawback in using this MTN unlimited SMS trick. Kindly read on. This trick is blazing hot and working perfectly well. Tested and confirmed by me (Victor Kachi). Kindly follow my steps below. >> After typing your message, in reciever's number, type 38708 followed by the recipient MTN number. "Total cost of last SMS sent was 0.00, and new account balance is blablabla"
With this trick, you don't have to use MTN's "Please Call Me Back" service anymore. I hope you loved and found this post useful? MTN free browsing cheat is cooking up. Stay glued to this blog and always visit us every time. Never miss out of our hot cheats and tutorials, download our Android app now to be the first to be notified with free browsing cheats. Download Entclass Blog official Android app from Playstore now - DOWNLOAD HERE. Please don't forget to drop your comments if it worked for you, and also, don't be stingy. Kindly Share this post using the Share buttons below. Mtn free sms cheat. Mtn free sms code. Send free sms on MTN. Latest free sms trick on MTN 2017. I know the reason behind that. There's a keyword you inputted in the text message that made it not to deliver your message. Don't add words like receive, text, reply etc. Now, try resending a new text message without these keywords and see that your message will be delivered. I sent 3 msgs , Al sent but I called the recipient and she told me she didn't see any text. It's working perfectly well. Also, mind the type of words you type in the message, because it's the reason why your message is not delivered. Send me your MTN number and i will send you a text now for you to see. ...and it said sent....but the perei send it to said she did received any sms....at list people have said the same thing.....it can send but it won't delivered ?